The second marina of Melendugno is Torre dell’Orso (“Bear Tower”), which draws in many tourists from all over the world because of its wide sandy beaches and clear sea. The marina’s waters are especially pristine because of the protection offered by the nearby Otranto Canal. The beach is a cove about 800 meters long. It is bordered by two high cliffs which shelter the beach from southwest winds. In the southern end of the beach there is a stream called “Brunese”. At the southern end of the reef is Grotta di San Cristoforo (“The Cave of St. Christopher”). Inside that has been discovered ancient graffiti along the cave walls. Decades ago, fishermen used the caves discovered in the north of the bay, to store gear. 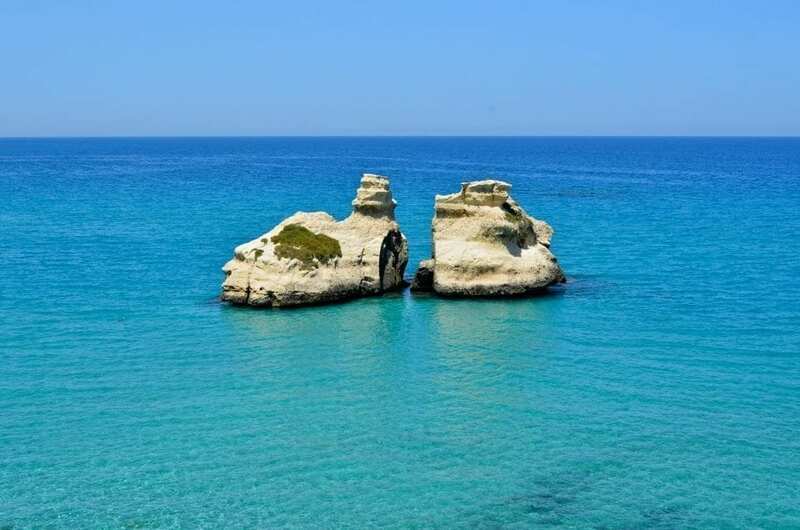 Far south of Torre dell’Orso, a short distance from the beach, visitors will find two rock formations called “Le due Sorelle” (“The Two Sisters”). According to local legend, the name comes from two sisters who one day decided to take a cool swim in the sea. They climbed up Torre dell’Orso and plunged into the sea. Unfortunately, stormy waters prevented the girls from reaching the river bank. The Gods decided to show compassion and erected the drowning girls into two beautiful rocks.